VapeXhale EVO is truly best in class for both flowers and oil, which can help save you a ton of money and reduce the number of devices you need to own. Do you remember the last time you used a tabletop vaporizer? Maybe you felt a little less thrilled than when you first took a bong hit or a dab. You may have gotten the flavor of your flower, but maybe not a huge puff of smoke. It may have been hard to tell whether you were even getting a hit at all. Sound familiar? These are common complaints with traditional tabletop vape devices. While vaping is a much healthier way to consume cannabis, the culture is taking a long time to catch on. VapeXhale is changing all of that. The company is bringing a healthy, high-tech approach to vaping with a device that really hits as hard as you want it to. These vapes have serious roots in the medical cannabis space. Seibo Shen, the CEO behind the VapeXhale devices, was a professional stuntman and jiu-jitsu competitor for years and used cannabis to treat pain from several injuries he sustained during that time. He switched to vaping early on but realized something was lacking… huge clouds and higher levels of medication. Shen embarked on a mission to combine the convenience and power of a water pipe with the effectiveness of a vaporizer. That’s where the idea for VapeXhale EVO came from. It uses a convection-based (hot air) heating system to surround your cannabis with super-hot air, providing you with clean and delicious vapor to fuel your lifestyle. 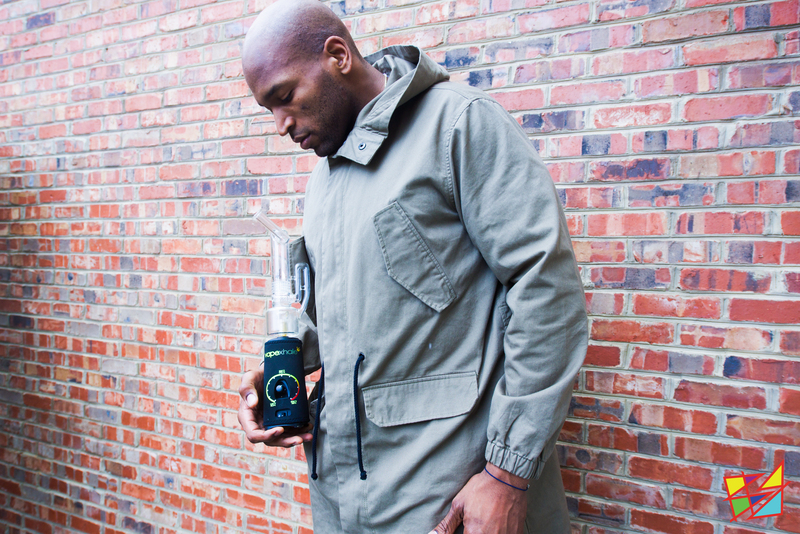 The EVO is the preferred vaporizer of many current and former athletes, from the amateur to professional level, including ex-NFL player, Eugene Monroe. A big part of the appeal of the EVO is that it has adjustable temperature controls, and it’s damn-near impossible to burn your flower or concentrate. That’s because of the patented PerpetuHeat Thermal Technology which ensures consistent heat so that you get thick, milky vapor each and every single hit. This technology recently won them two Best Product awards at the Cannabis Cup, one for flower capabilities, the second time for the oil capabilities. It is one device that is truly best in class for both flowers and oil, which can help save you a ton of money and reduce the amount of devices you need to own. This “hot-air” tech results in tons of benefits for the medicinal or recreational user. With it, you’ll get a much fuller flavor and vapor stream with every hit. With the HydraTube attachment, you’ll feel like you’re smoking on a traditional bubbler rig, but getting all the healthful perks of vaporizing at the same time. Chili Buddha of Vancouver has been consuming cannabis daily for 40 years and says has never experienced this type of potency with a vaporizer or any other consumption device for that matter. Another advantage of the hot air technology, especially with concentrates, is better taste and potency. VapeXhale utilizes an industry first, 100% glass air path that allows the full terpene spectrum and profile to shine through so you can actually taste the citrus after taste or the oak-like vapor that tickles your nose as you inhale. Not only do you get a superior taste, but the hot air dab methodology only requires a third of the amount to get the same level of medication as traditional delivery mediums due to the fact that less material is destroyed on a hot, sizzling surface. Their hot air dabbing is much more thorough, gentle, and efficient so that all the cannabinoids and terpenes are gently sublimated and not burnt. Just ask BC Bubbleman who will only dab his terps thru the VapeXhale EVO. It’s the only vape that allows you to easily switch between flower and dabs and back again with absolutely no mess or downtime. It’s portable in that the glass pieces separate from the base, and are well-built enough to be carried to the function in a padded bag. You’ve likely used an EVO if you have been to a cannabis sampling event in California. If not, keep your eye out, as they are the vaporizer to watch in 2017. You can cop your very own VapeXhale EVO Standard Starter Kit for just $349; a HydraTube Starter Kit for $449; or, go for their new limited edition special: the fully-loaded StoneMonkey Survival Kit for $599. Use code HERB100 for $100 off any VapeXhale Starter Kit. View all their amazing products here. Plus, sign up to their newsletter for the chance to win a VapeXhale Shredder.